It's true, the devil himself, David Blaine is coming back to primetime television. This Tuesday night on ABC, Blaine will be performing a handful of his voodoo devil magic tricks on celebrities like Jamie Foxx, Woody Allen, Ricky Gervais, Aaron Paul and Charlie Villanueva. 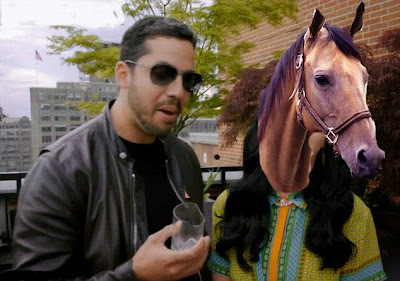 Although Blaine and ABC are keeping details of David Blaine: Real or Magic close to the vest, TVMWW was able to obtain these exclusive photos of him doing a magic trick on pop icon, Katy Perry. Keep your eyes on my jacket. Are you still looking at my jacket? Make sure you keep your eyes on my jacket. It's a very nice jacket. Blaine's special airs this Tuesday night on ABC at 9:30pm. You should watch it 'cuz it's gonna be amazing and I'm obviously gonna blog about it. Or don't, who cares. I'm sure there's other cool stuff to watch instead. JK YOU SHOULD TOTES WATCH IT. That is the nicest set of hoots that I've ever seen on a horse. David Blaine is a friggin' magician.